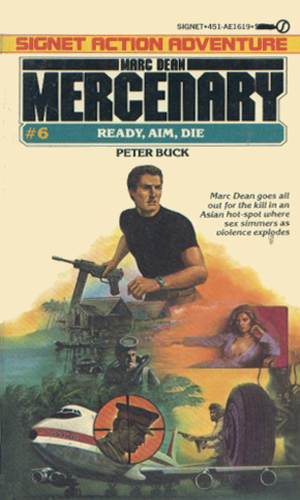 Marc Dean is a mercenary. Dean is a 38 year-old former U.S. Army lieutenant who served in Vietnam where he learned to hone his skill as a fighting man. According to his bio, Dean earned a Bachelor's degree from Yale in languages and a Master's from USC in political science, making him a natural for international intrigue. After his time in the Army, Dean worked as an aid to the Senate's Committee on International Relations before taking a position with the Peace Corps which took him to numerous places around the globe. Incongruously, it was after this humanitarian service that Dean took a job as an international arms salesman working for a major corporation. 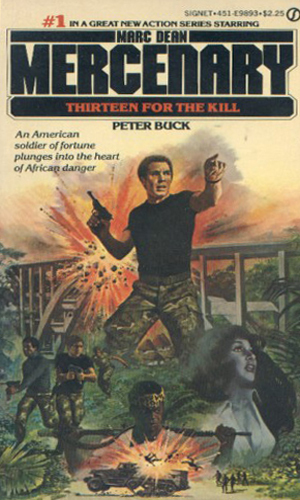 An assignment to help train troops in Angola against the Soviets and Cubans became the bridge to his subsequent role as a mercenary. Dean is divorced with a young son that he dotes on. He maintains two apartments, one in Paris and one in Brussels, for when he is not on assignment. He possesses a strong personal code of ethics that often puts him in disagreement with would be clients but makes it easier to sleep at night. He has turned down more missions than he accepts because of his personal creed. The missions that Dean takes is the reason for his qualification for inclusion in this book. They are all certainly international in scope. They usually involve working for governments, including his own, and always deal with life and death situations. While he will work with others as is normal in his trade, he is quite comfortable working alone and is deadly either way. 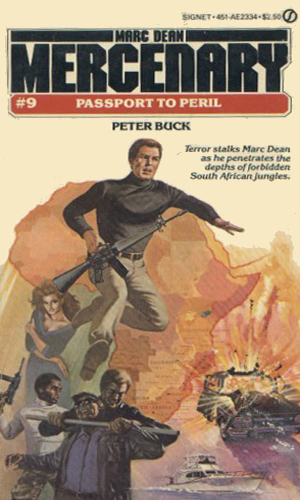 Marc Dean is hired to take control of a fortress deep in Africa from the rebel leader holding it and destroy the band threatening a country's stability. 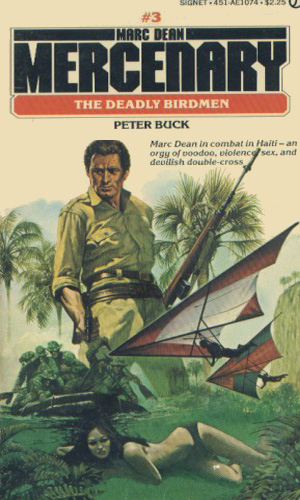 The U.S. government asks Marc Dean to take a few men into the jungles of Brazil to stop a huge construction program by unrepentant Nazis out to try again for glory. The crazed dictator of Haiti has some outlandish plans ahead for his country. Marc Dean is hired to make sure it doesn't succeed. The biggest fee he had ever earned was the motivation behind sneaking in Soviet controlled lands to rescue a scientist with a secret worth billions. On the Mediterranean island of Corsica, Arab terrorists are joining with Mafia hoods in an alliance that Marc Dean is hired to break up for good. Someone is determined to see the king of a small Asian nation dead. Marc Dean's job is to keep that from happening. Soon it becomes clear that his real job is to be a fall guy. 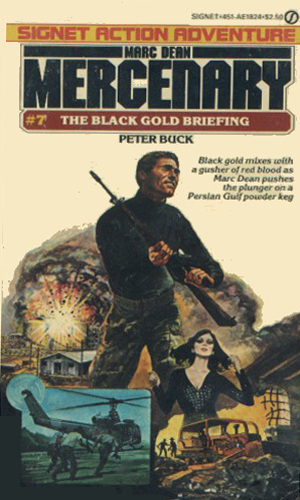 The mission in this assignment was to take out for good a despotic Arab country's leadership to free up an oil blockage that threatens the West. In Turkey at a remote U.S. facility, extremists have taken control of a missile silo and the CIA wants Marc Dean to get it back. 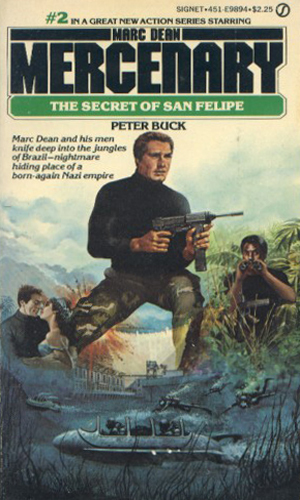 The mission was to free an imprisoned South African black leader but the number of people who didn't want Marc Dean to succeed seemed to be constantly growing. In this compendium of spy series, it becomes hard at times to draw a solid yellow line down the road marking what does or does not qualify. Stories of army troops involved in warfare would not qualify under most circumstances but occasionally, an action series forces its way in because of the story matter. 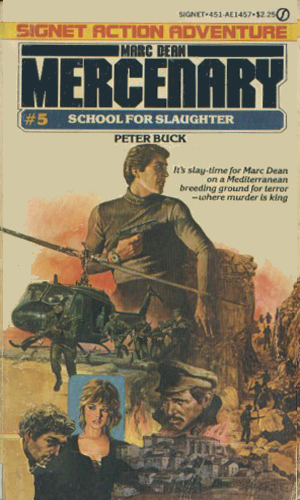 This is definitely the case with the adventures of Marc Dean, the Mercenary, a nine-book series that ran briefly during the early 80's. Though I have done some fence-sitting as to whether Marc Dean's adventures belong in this collection, I cannot deny that the quality of the work and the excitement of the adventures definitely earn it a place. The author has the international feel down quite well and he makes good use of Dean's experience and savvy. The books are pretty good! I'd agree that the Mark Dean series belongs here...there definately intrigue and double cross involved in each installment. 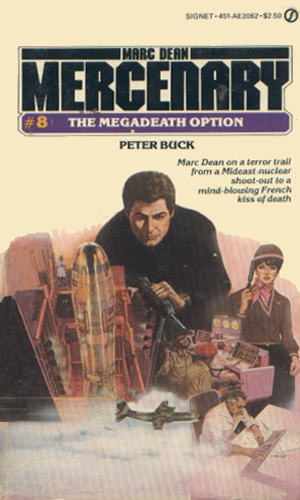 This series had some of the best cover art of the eighties. 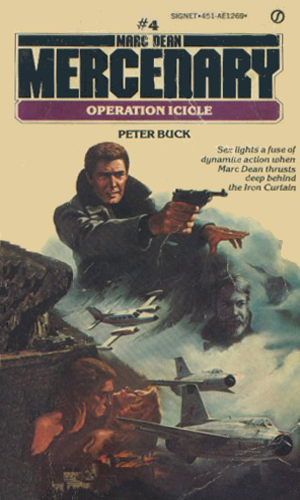 I think the book cover for Operation Icicle is one of the best pieces of cover art ever.